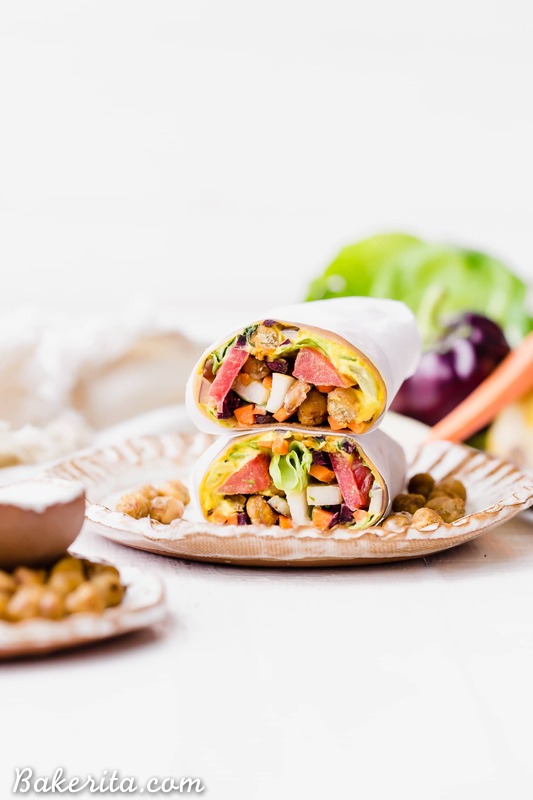 These Roasted Chickpea Veggie Wraps are a delicious gluten-free and vegan lunch or dinner that you can make ahead of time. They have a wonderful Turmeric Hummus spread inside and a Tahini Dressing/Dipping Sauce to serve with! This post is sponsored by Sunfood. Alright, you guys have asked for it and I’m finally coming through with some easy lunch meals!!! Since I work from home, I don’t spend too much time thinking about lunch prep, but I know for most of you, it’s a common thought and I wanted to start giving you guys some good, healthy options that aren’t too difficult to prep and are super delicious. 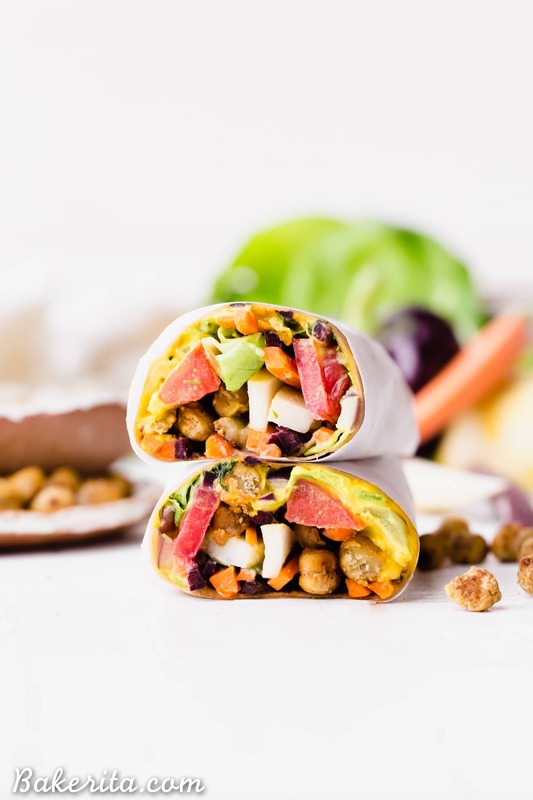 These Roasted Chickpea Veggie Wraps definitely fit the bill. They are so tasty that I’m definitely going to be making them on the regular for myself for lunch…or dinner…or literally any time. Because the freshness + flavors in here are unreal, and you can customize it to what you’ve got on hand. I would recommend trying the version as written first though because it’s sure to get you HOOKED. Now, I did go a little wild and make hummus AND tahini sauce AND roasted chickpeas from scratch for this recipe. It sounds like a lot of work, but none of it takes very long to make and you’ll have extra of the hummus + chickpeas (unless you snack on all of them while building the wraps like I did…oops). The tahini sauce isn’t 100% necessary, but I found it to make things even more delicious and since it only takes about 2 minutes to throw together, why not try it? 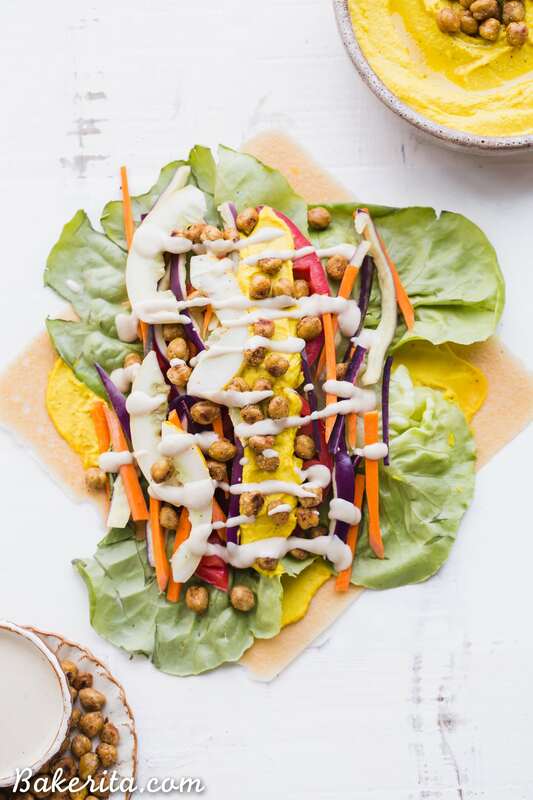 Let’s make Roasted Chickpea Veggie Wraps with Turmeric Hummus and Tahini Dressing! Let’s start by chatting about the hummus. Have you ever made your own? This was shockingly my first time and it was SO EASY that I’ll be making hummus regularly now. It took less than 5 minutes and you can totally customize to your favorite flavors. I made this version super vibrant and anti-inflammatory with some of Sunfood’s organic turmeric powder. 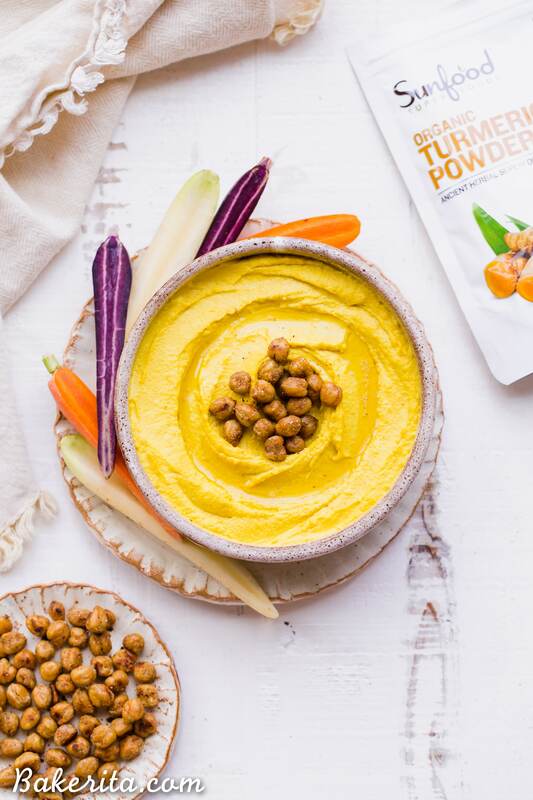 Turmeric’s active ingredient, curcumin, is known to be a powerful antioxidant that helps support a healthy inflammatory response, healthy joints, muscles, the immune system, and the brain. This recipe also contains a bit of black pepper, which helps your body absorb the curcumin in the turmeric. After blending up chickpeas for your hummus, you’re also going to make some chickpeas super crunchy. I like to do this on the stove by sauteing the chickpeas in a little avocado oil, garlic powder, cumin, salt, and pepper – they get super crunchy and flavorful after about 10-15 minutes over medium-low heat. I bet you’ll have a hard time not snacking on them all. Now let’s fill those WRAPS! Instead of a tortilla, I used Sunfood’s Organic Coconut Wraps – they are SO good. The ingredients are beyond simple too – made with just Raw Organic Coconut Meat, Raw Organic Coconut Water, and Raw Organic Unrefined Virgin Coconut Oil. I used the original flavor, but they also have a turmeric flavor and a moringa flavor if you want to pump up the superfoods. They make the perfect sized wrap for me for lunch. 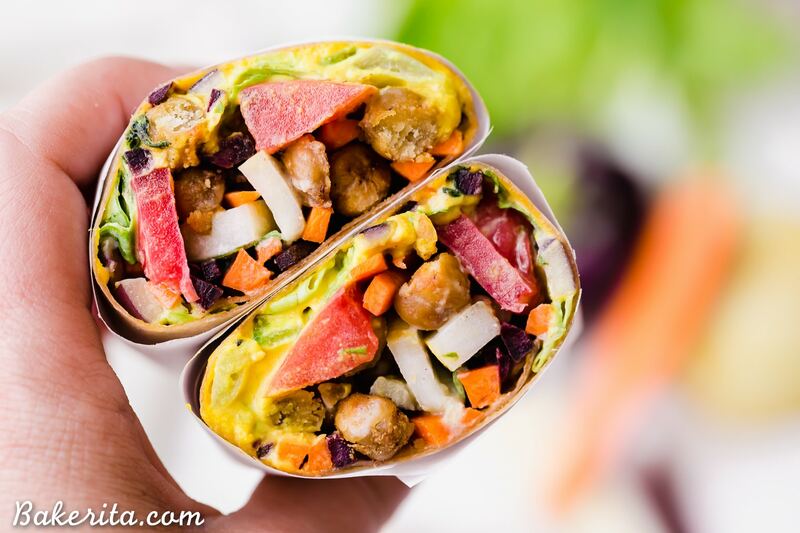 To construct the wraps, you spread some of the turmeric hummus on the wrap, and then pile it up with veggies. I used julienned carrots, cucumbers, bell peppers, tomatoes, and lettuce. You can customize based on your favorite veggies or use what you have on hand. The roasted chickpeas are put on top and then you can either drizzle the whole thing with tahini sauce OR wait and just dip the wrap in it. I’d go with the latter unless you’re eating it immediately. 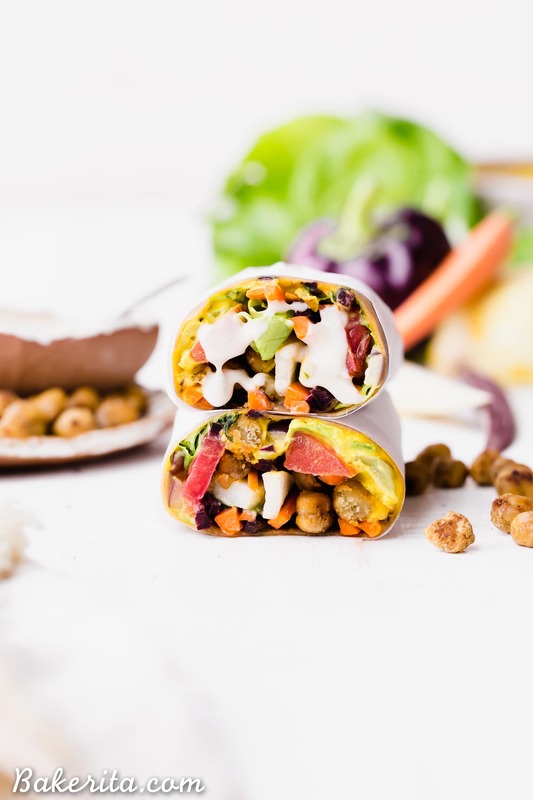 These Roasted Chickpea Veggie Wraps are a delicious gluten-free and vegan lunch or dinner that you can make ahead of time. They have a wonderful Turmeric Hummus spread inside and a Tahini Dressing/Dipping Sauce to serve with! In the bowl of a blender or food processor (I used my Vitamix), combine the tahini and lemon juice and process for about 1 minute, scrape the sides and bottom of the bowl then process for 30 seconds more. Add the garlic, sea salt, turmeric powder, black pepper, chickpeas, and 2 tablespoons of olive oil. Blend until smooth, adding more olive oil as necessary to reach your desired consistency. Taste and adjust seasonings as necessary. Transfer to a bowl or container to store and put in the fridge to chill. Whisk together the tahini and lemon juice. Add water 1 tablespoon at a time until it reaches your desired consistency. Add salt, pepper and garlic powder to taste. Make sure your chickpeas are dried super well so they get crisp after rinsing. Heat 2 tablespoons of avocado oil in a nonstick skillet. Add the chickpeas to the pan and sauté for about 10 minutes, or until starting to get golden and crisp, stirring often. Add the spices and then sauté for another 5-10 minutes, or until they’re crisped to your liking, before placing in a bowl to cool. You’ll have extra to snack on! Lay out each of the coconut wraps on a sheet of parchment paper. On the bottom third of each (leaving about an inch of space on the bottom), spread the turmeric hummus in the center, leaving some space on each side so it doesn’t spill out the side when you roll it up. Top with the lettuce, carrots, cucumber, heirloom tomato slices, bell pepper slices, making sure you’re not adding too much or it will be very hard to roll up. Add the roasted chickpeas on top and drizzle with tahini dressing, if desired (best if you’re eating right then - save as a dipping sauce if you’re keeping it for later). Use the parchment paper to help fold up the sides of the wrap, and then roll it up, keeping it tightly rolled with the parchment. If you’re saving for later, fold up the parchment so it doesn’t open. If you’re eating now, slice in half with a very sharp serrated knife. If saving for later, store in the refrigerator. Will be best enjoyed within ~48 hours. Serve with tahini dressing and enjoy! You'll likely have leftover hummus and tahini sauce! Maybe some roasted chickpeas too, if you don't snack on all of the leftovers. « All About Mushroom Coffee + My Mushroom Coffee Mocha Recipe!